Concrete is the most basic flooring material. Generally, it is just the surface of the slab that is poured directly onto the gravel or dirt bed in order to install the foundation of a building. Strong, durable, and extremely long lasting, it has also developed a reputation for being austere, utilitarian, and course underfoot. However modern advancements have given flooring professionals a variety of design options that are allowing them to completely reinvent this basic building material. 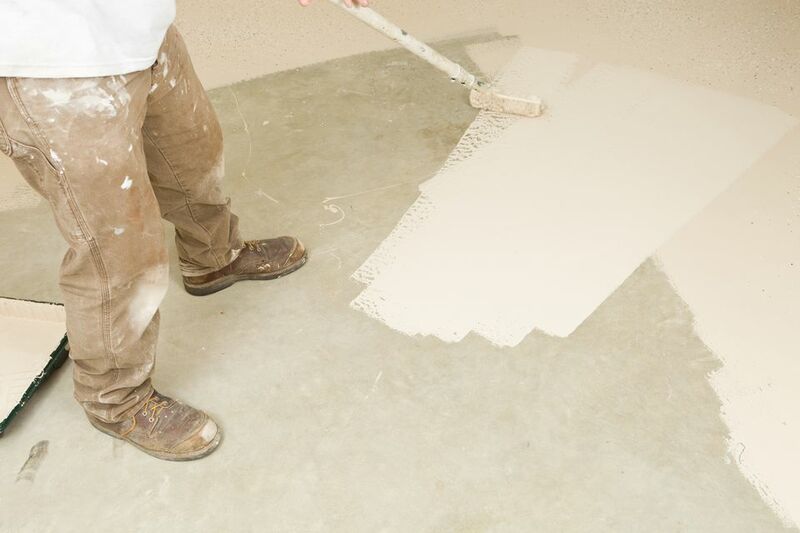 Today concrete floors can be polished smooth, or textured to provide traction. They can also be painted or stained with a variety of techniques that allow you to replicate the look of natural materials, or embed the floor with complex printed designs. Most structures are built on a sand or gravel bed that rests beneath a concrete slab that acts as the base of the building. This layer is covered with a vapor barrier sheet that prevents moisture from moving up into the concrete. A welded wire fabric mesh sheet is then placed over that in order to aid with adhesion. Finally, the concrete slab is poured directly onto these layers. In some places, the concrete will extend downward in either monolithic or footed foundation which will act to anchor the structure to the earth. These beams extend down past the frost line and are often surrounded by insulation and hard sheet material in order to protect their structural integrity. The concrete slab is smoothed and then allowed to dry for an appropriate amount of time. At this point, it can be treated in order to be used as the basic floor surface for the structure. Alternatively, you can also use this surface as a base in order to install other types of flooring over it. Despite its strength and durability concrete is a porous material. That means that water will be able to penetrate its surfaces, and move through the internal structure of the piece. Unfortunately, the earth and gravel bed that foundation slabs are installed on containing varying levels of water, based on how humid and rainy it has been in the area recently. If a vapor barrier is not installed in between these two surfaces moisture can penetrate the concrete slab, causing mold and mildew to grow within your home. In some cases this moisture can also freeze under cold conditions, expanding, and causing cracking in the foundational structure of the building. Kitchens: Concrete flooring is popular in this room because it is durable and easy to clean. It can be sealed against moisture damage ​and made virtually impervious to staining agents.